Deficit Reduction, Minus the Reduction. This was published in the New York Times on April 11th, 2013, but I thought that it was worth sharing. This type of policy debate is not simple, but that doesn’t mean that people shouldn’t try to know about it, And Steve Rattner puts it into a great perspective. So maybe just give it a quick look. President Obama’s new budget, released on Wednesday, is stuffed with constructive ideas. It bravely outlines concrete steps to begin fixing Social Security. It flouts today’s all-deficit-cutting, all-the-time mentality with important proposals for fresh spending on infrastructure and universal prekindergarten education. It includes detailed plans to close tax loopholes and raise needed revenues from the wealthy. But in one critical area — long-term deficit reduction — the president has offered less than not only the House Republican budget but also the proposal by the Senate Democrats. Over a 10-year horizon, his deficit-reduction plan doesn’t have enough, well, deficit reduction. That shortfall illustrates the challenge of budget making in a constrained world: in formulating his budget, the president was trying to simultaneously hold spending cuts at sensible levels, provide funding for his important new initiatives and confine tax increases nearly entirely to the wealthy. 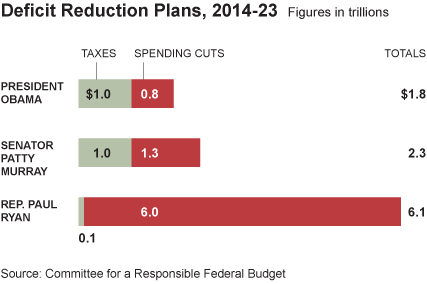 The consequence of respecting those goals is illustrated in the graph on deficit reduction plans. The president proposes to raise about as much new revenue as the Senate Democratic plan, but wants to spend $520 billion more over the next 10 years. Not shown in this chart — but important to note — is that the Senate offering comes with a big asterisk. As with the president’s proposal, the Senate version assumes the government will get approximately $1 trillion of new revenue over the next 10 years. But unlike Mr. Obama, who outlines specific proposals for new taxes, the Senate doesn’t specify where its trillion would come from — making its income statement a bit more magic than math. 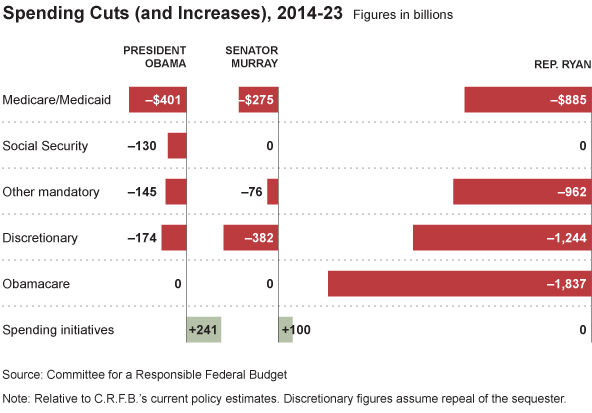 The chart on cuts details the differences in spending plans, most important the president’s desire to replace the $1 trillion of terribly constructed forced budget cuts known as sequestration with more surgical reductions of $174 billion in spending on discretionary programs, including defense. Mr. Obama also wants $241 billion of new spending in the short-term, to try to get our sluggish economy moving again. Included in that total is $50 billion for roads and other badly needed infrastructure programs. That’s all great — there’s nothing inconsistent about doing more to help the economy in the short run while still addressing the long run challenges. But the graphic on future debt ratios shows the all-in consequences of the president’s plan. He would allow the country’s ratio of debt to gross domestic product — budget wonks’ favorite measure of our fiscal health — to rise over the next few years by more than would even occur by continuing current policies. After 2015, the president’s plan would cause the ratio to decline slowly, getting back to approximately its current level by 2023. In contrast, the Murray plan would result in a debt to G.D.P. ratio that would be three percentage points lower. That may not sound like much, but by 2023, with our economy projected to be $25.9 trillion a year, it’s a difference of $674 billion of debt. By getting the debt to G.D.P. 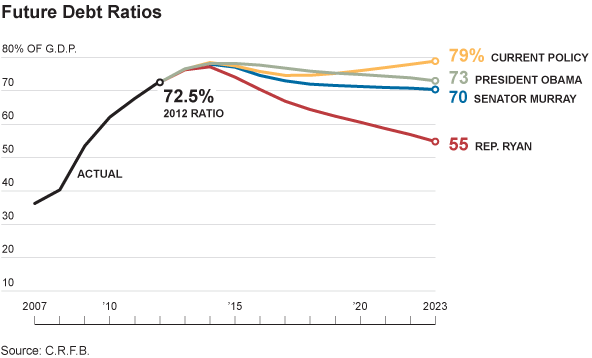 ratio back to 73 percent by 2023, the Obama budget meets the minimum goal of any sensible fiscal strategy. However, it leaves no margin for error — no margin for a Congress that finds it easy to avoid cutting spending and raising taxes, no margin for the possibility that the economy doesn’t achieve the assumed growth levels over the next decade. All told, the president should be commended for producing a fully detailed set of proposals that both address the short-term needs of a slow economy and begin to tackle the long-term challenges posed by an aging society that increasingly relies on underfunded Medicare and Social Security programs. But we shouldn’t kid ourselves: we will need to make more tough choices — tougher choices than we are inclined to make today — if we are to avoid burdening future generations with massive unfunded obligations.